তোমার দেওয়া লেহ্য ডেভনশায়ারের ননীর মত।"
"তারা লতা-গুল্ম খেয়ে বাঁচে .... যেমন তাদের টিন ও সীসার খনি আছে, তারা এই ধাতু আর তাদের গবাদি পশুর চামড়া সমুদ্রবণিকদের দিয়ে দেয়.... তারা অলিভ অয়েলের পরিবর্তে মাখন ব্যবহার করে"
প্রথাগত পদ্ধতি অনুসারে, টাটকা গরুর দুধ প্রথমে পরিশ্রুত করা হয়, তারপর একে শীতল পরিবেশে অগভীর পাত্রের মধ্যে কয়েক ঘণ্টা রেখে দেওয়া হয় যার ফলে এর ননী অংশটি উপরিতলে উঠে আসে। এরপর একে উত্তপ্ত কাঠকয়লার মাধ্যমে অথবা জলগাহে উত্তপ্ত করে, পরে ধীরে ধীরে ঠাণ্ডা করা হয়। এর উপরিতলে একটি তঞ্চিত স্তর তৈরী হয়, লম্বা হাতলযুক্ত উকড়ি বা স্কিমার (Skimmer) দ্বারা উপরিভাগের এই দানাদার স্তরটিকে ফেলে দেওয়া হয়; এই উকড়ি/স্কিমারটি ডেভনে রীমার বা রেইমার (Reamer/Raimer) নামে পরিচিত। ১৯৩০ - এর দশকের মাঝামাঝি, ডেয়ারী থেকে আনা দুধ সরাসরি ব্যবহারের চিরাচরিত পদ্ধতি ডেভনে বন্ধ হয়ে যায়, কারণ এই সময় থেকে ননী-বিশ্লিষ্টকারী (Cream-Separator) নামক যন্ত্রের দ্বারা কেন্দ্রাতিগ বল ব্যবহার করে দুধ থেকে সক্রিয়ভাবে ননী পৃথক করা হতে লাগল, এতে একই পরিমাণ দুধ থেকে অনেক বেশি পরিমাণ ননী পাওয়া যেতে লাগল। পাউণ্ডস্‌গেটের এক কৃষকের স্ত্রীয়ের কথায় - "এই সেপারেটর যন্ত্রই সমস্ত গো-প্রজাতিকে বাঁচিয়েছে।"
↑ "BBC - Devon Great Outdoors - Tony Beard's Dartmoor Diary". ↑ ক খ গ ঘ "Interview with Nicholas Rodda". Retrieved 2 December 2010. ↑ Figioni, Paula (2010). How Baking Works: Exploring the Fundamentals of Baking Science. John Wiley and Sons. p. 363. ISBN 0-470-39267-3. ↑ ক খ গ ঘ Early, Ralph (1998). The technology of dairy products. Springer. pp. 45–49. ISBN 0-7514-0344-X. ↑ ক খ Spencer, Nikki (30 May 1998). "The tartars of cream". The Independent. London. Retrieved 2011-01-07. ↑ ক খ গ Anderson, Lisa (23 January 1985). "'Clotted cream' caviar of dairy". Ottawa Citizen. Retrieved 3 December 2010. ↑ Barnett, Anne (1998). Understanding Ingredients. Heinemann. p. 26. ISBN 0-435-42827-6. ↑ Clay, Xanthe (13 July 2007). "Full fat takes the cream". The Daily Telegraph. London. Retrieved 2011-03-01. "No one is suggesting that eating clotted cream for breakfast every day is life-prolonging, but a moderate amount of dairy fat in your diet is not only not going to do you harm, it's actually healthy, as well as life-enhancing." ↑ Scarborough, P.; Rayner, M.; Stockley, L.; Black, A. (2007). "Nutrition professionals' perception of the 'healthiness' of individual foods" (PDF). Public Health Nutrition. 10 (4): 346–353. doi:10.1017/S1368980007666683. Retrieved 5 May 2013. ↑ Food Standards Agency: Manual of Nutrition. HMSO London. 2008. ↑ Terry Marsden; Jonathan Murdoch (2006). Between the local and the global: confronting complexity in the contemporary agri-food sector. Emerald Group Publishing. pp. 306–309. ISBN 0-7623-1317-X. Retrieved 2 December 2010. ↑ Alan Davidson; Tom Jaine (2006). The Oxford companion to food. Oxford University Press. p. 225. ISBN 0-19-280681-5. ↑ "The Pre-Norman Landscape". Flyingpast.org. ↑ See for instance: A tour through Cornwall, in the autumn of 1808. Wilkie and Robinson. 1809. pp. 360–361. and Spencer, Nikki (30 May 1998). "The tartars of cream". The Independent. London. Retrieved 2011-01-07. ↑ Lane, John (1998). In Praise of Devon: A Guide to Its People, Places and Character. Dundurn Press Ltd. ISBN 1-870098-75-7. 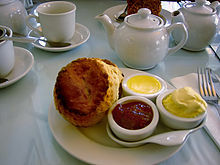 ↑ "Did cream teas originate in Tavistock in 997AD". BBC News. 17 January 2004. Retrieved 3 December 2010. 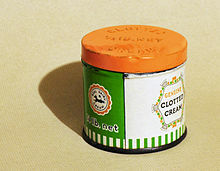 ↑ "To make Clouted Cream - Vintage Recipes". ↑ Sinclair, Sir John (1807). The code of health and longevity: or, A concise view, of the principles calculated for the preservation of health, and the attainment of long life. Printed for A. Constable & co. pp. 272–273. 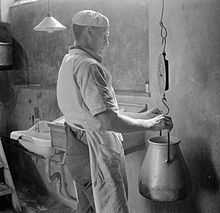 ↑ "Rural economy: The dairy". New York Times. 21 January 1853. Retrieved 3 December 2010. ↑ The transactions of the Provincial medical and surgical association. Provincial Medical and Surgical Association, Worcester,. 1839. pp. 203–204. ↑ "Directive 98". 30 September 1998. "supplementing the Annex to Regulation (EC) No 2400/96 on the entry of certain names in the Register of protected designation of origin and protected geographical indications"
↑ ক খ "EU Protected Food Names Scheme — UK registered names — National application No: 03514: Cornish clotted cream". Department for Environment, Food and Rural Affairs. Archived from the original on 22 August 2013. Retrieved 10 July 2016. ↑ ক খ গ Fielden, Marjory Eckett (1934). "Old-time survivals in Devon". Report and Transactions of the Devonshire Association. Torquay: The Devonshire Press. LXVI: 367. ↑ A. H. Varnam; Jane P. Sutherland (2001). Milk and milk products: technology, chemistry and microbiology. Springer. pp. 204–205. ISBN 0-8342-1955-7. ↑ "Rodda's clotted cream boss whips up a media frenzy". The Observer. London. 22 May 2011. Retrieved 12 March 2013. ↑ "Forty-five jobs go in dairy close". BBC News. 23 October 2006. Retrieved 2 December 2010. ↑ "Fury as 'Definitely Devon' clotted cream is made in Cornwall and label says add jam first". This Is Devon. 21 April 2011. Retrieved 13 June 2011. ↑ "Trading probe into 'Definitely Devon' claims". This Is Cornwall. 26 May 2011. Retrieved 13 June 2011. ↑ "Restaurants in UK - Book UK Restaurants - Bookatable". ↑ "Dorset Afternoon Teas at Heights Hotel on Portland". Heights Hotel. ↑ The Teashop, Ross-on-Wye Archived June 21, 2013, at the Wayback Machine. ↑ "Devonshire (Clotted) or Devon Cream Recipe". Joy of Baking. Retrieved 3 December 2010. ↑ "Nigel Slater's Devonshire cream tea recipes". The Guardian. London. 22 August 2010. ↑ "The History of Devonshire Tea". ↑ "How do you do take your cream tea?". BBC News Online. 9 June 2010. Retrieved 2 December 2010. ↑ Wilfrid Prest; Kerrie Round; Carol S. Fort (2001). Wakefield Companion to South Australian History. Wakefield Press. p. 210. ISBN 1-86254-558-8. ↑ Savill, Richard (20 May 2010). "Cream teas battle rages between Devon and Cornwall". The Daily Telegraph. London. Retrieved 3 December 2010. ↑ "Devon cream tea campaign put to government". BBC News. 8 June 2010. Retrieved 2 December 2010. ↑ "Britain's Best at Teatime". The New York Times. 5 September 1982. Retrieved 2007-01-28. ↑ "BBC - Food - Clotted cream recipes". ↑ "Clotted cream: the perfect summer treat". The Guardian. London. 22 June 2011. ↑ A gift to young housewives. Indiana University Press. 1998. pp. 368–369. ISBN 0-253-21210-3. ↑ Viccars, Sue (2011). Frommer's Devon and Cornwall With Your Family. Frommer. p. 238. ISBN 0-470-74947-4. ↑ Sandles, Tim. "Dartmoor Clotted Cream". Legendary Dartmoor. Retrieved 2010-12-03. ↑ Smith, Noble (2012-10-30). "The Wisdom of the Shire: A Short Guide to a Long and Happy Life". books.google.com. p. 13. Retrieved 2017-01-26.